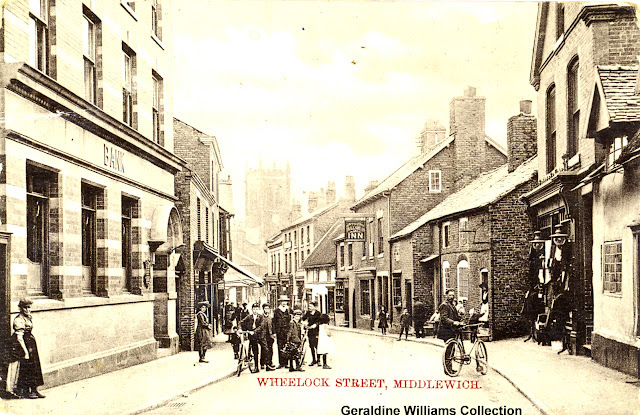 What strikes me most when looking at really old photographs of Middlewich is not how many things have changed but how many have stayed the same. This old postcard, from Geraldine Williams' collection which was compiled by Miss Mary E (Polly) Gallimore before the First World War, shows Wheelock Street as it was before that war - probably around 1905 - and anyone looking at it now will instantly recognise the town's main street with what is now Barclay's Bank on the left (simply labelled at that time with the word BANK)* and the present-day Reed Rains Estate Agents on the right (the shop with the two gas lights outside it). The building next to it, on the extreme right, was, I believe, a public house but I'm unable to find a reference anywhere telling us what it was called. Which just goes to show that local newspapers, then, as now, sometimes have a slightly tenuous grasp of how things work. Middlewich's cinema survived until the early 1960s, and was one of the best in the area. It had excellent projection equipment and a good, large screen. The Alhambra was never a 'fleapit', it was a comfortable and enjoyable place to be, and it's good to know that the building survives, externally much as it has been since 1920, and that the name lives on as a slightly unusual name for a Chinese restaurant. We'll be returning to the history of the Alhambra later. Further down the street on the right hand side, another of the lost pubs of Middlewich, the Bulls Head can be seen and, as always, just visible through the mist in the background, St Michael & All Angels Church gives us our point of reference. * The Middlewich branch of Barclay's Bank closed in 2017. Is that the upstairs window of the White Bear that I can just see sticking out, on the left? YEs, I think you're right, Chris.